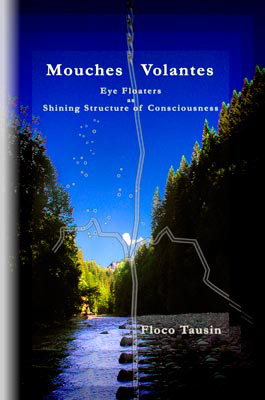 “Holistic Vision” is the quarterly newsletter by the author and consciousness researcher Floco Tausin. It deals with the medical, cultural and spiritual dimensions of subjective visual phenomena (see picture). Its main topic is the study of a phenomenon called “eye floaters” (or “muscae volitantes”) through open eye meditation: Are floaters in reality a shining structure of consciousness within which we cover a distance to our origin? Nestor speaks about the light of the consciousness structure that is caused by visual concentration. In every day life, we understand concentration as a careful examination of an object, while other sensory stimuli or thoughts are ignored. That way, we obtain knowledge or become able to solve specific tasks. If we concentrate on our floaters, we realize what that state of consciousness means in terms of energy: The spheres and strings become smaller, but more focused and bright. 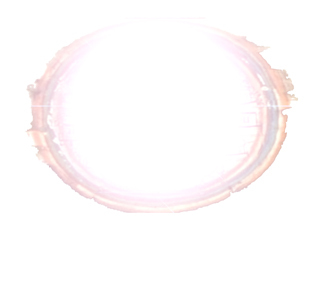 That indicates that we actually minimize our picture detail, but at the same time intensify it. Nestor calls that procedure “compressing the layers of consciousness,” in which the energy or light that we need to perceive the whole picture compresses on that smaller detail, or on smaller space respectively. If you want to delve deeper into the mystery of the shining structure, Nestor advises to increase concentration until the floaters light up in every session of open eye meditation. That’s because the seers understand concentration – and its contrary, relaxation – as ways to release the fixation of ourselves on one particular layer of consciousness and become mobile throughout different layers – or states – of consciousness. Visual concentration is the deliberate act of seeing that only allows for movements within a layer. However, together with the building up of energy, concentration leads to ecstatic relaxation, the involuntary, intuitive act of seeing, through which we penetrate the layers of consciousness and fly towards our source and origin. In our recent exchange about the Tibetan Buddhist Dzogchen philosophy, Manu explains an exercise that he has learned when he studied the visual practices of thögal (thod rgal). Thereby, the “bindus in the vitreous” (floaters) must converge with the “optical rainbow bindus.” Manu uses the Sanskrit term bindu (“drop”) for the shining spheres that appear as a result of that practice (cp. Tausin 2012a). 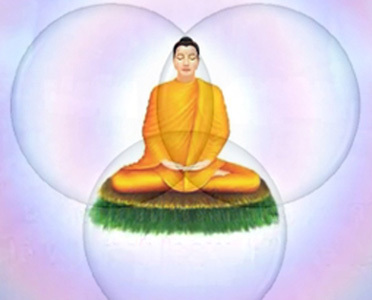 According to the tradition, this convergence gives rise to the vision of a Buddha. Sitting and meditating Buddhas in or in front of concentric rings are a common motif in Tibetan Buddhist art. Today, we rather focus on the Buddha and understand the circles around his body or head as an artistic convention, namely halos (aureola, nimbus). 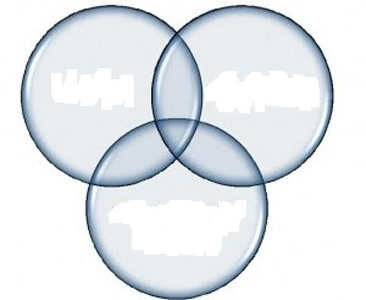 Originally, however, these circles could have been inspired by optic and entoptic phenomena perceived by Tibetan yogis and shamans while in altered states of consciousness. In contrast, the Buddhas are more likely to be interpreted as visions or visualizations. Thus, these Tibetan depictions can be understood as a mixture of several subjective visual phenomena, both culture-specific (visions) and culture-independent (optic and entoptic phenomena) (cp. Tausin 2012b). Now, Manu’s point is that the Buddhas seen in thögal practice and in paintings may not only have a purely cultural or traditional background, but an optic or entoptic origin as well. Interesting idea. But whether such a constellation of spheres actually occurs in the dynamic seeing of floaters that is long and distinct enough to give rise to the vision of a Buddha, is beyond my experience and not clear to me. As always, there is only one way to find out: seeing! Works of art from different cultures and times that represent entoptic phenomena or could have been inspired by them.. Even today, there are many artists who are inspired by entoptic perceptions and do entoptic art (cp. Tausin 2007). So does Surmeet Kaur. 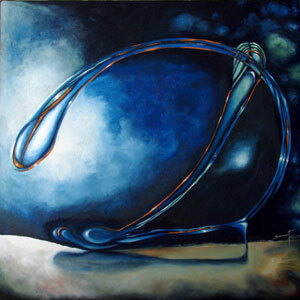 Surmeet is an Indian painter to whom entoptic phenomena are meaningful not only artistically, but also spiritually. For several years, she has been experimenting with psycho-physical practices which are part of her creative work. Her work starts with meditation, e.g. in the form of dancing, focusing on her own eyes in a mirror, practicing yoga or sitting quiet. Then she sits with her eyes closed, feels into herself and starts sketching the entoptic forms that show up before her eyes. 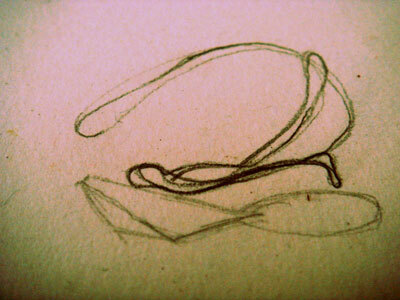 She then transfers these forms on canvas and, thereby, breathes life into them. Surmeet’s sketch of an entoptic phenomena that later became “The Blue Dragonfly. “The Blue Dragonfly” is a painting of the series “Mystique Dialogue.” To Surmeet, painting is indeed a way to enter into dialogue with the mystic, but also with her inner self and her unconscious, and, thus, to learn the deeper meaning of her creative work. This is the final step that sometimes takes days, weeks or months to be fulfilled, if at all. For 15 years, research on psychedelic substances gains steam after a forty-year break for political and social reasons. Likewise, this study from Hungary picks up a topic that was researched in the 1960s: the impact of psychedelic substances on human creativity. In contrast to these earlier studies, the authors apply modern research standards to determine psychometric measures of creativity. In addition, they combine creativity research with the archaeological and ethnographic research suggesting entoptic phenomena as a source of inspiration for the visual art of prehistoric or modern tribal societies. Thus, the authors want to find out how human creativity changes through the use of psychedelics, and what role entoptic phenomena play in this creative expression. For this purpose, 40 individuals completed a creativity test (Torrance Tests of Creative Thinking, TTCT) before and after they participated in a two-week long ayahuasca ceremony (with repeated ingestion of the drink) in Brazil. A comparison group of 21 individuals without psychedelic experience also took the Torrance test twice, two weeks apart, without participating in the ceremony. The test consisted of two visual tasks: Participants were asked to draw as many pictures as possible starting from 35 circles in eight minutes, then to complete ten given abstract shapes in ten minutes. The results were evaluated by two independent observers and according to standardized scoring procedures, namely in terms of three aspects of creativity, “fluency,” “flexibility,” and “originality.” Also, attention was paid to the presence of six frequently mentioned types of entoptic phenomena, namely grids, parallel lines, dots or small spots, zigzag lines, curves, and meandering lines or spirals. Six types of entoptic phenomena, according to Lewis-Williams und Dowson (1988). The results of the study show that repeated ayahuasca ingestion has no effect on fluency and flexibility, but it significantly increases the number of highly original solutions. In addition, the ayahuasca participants drawn significantly more entoptic forms after the ceremony than before, and significantly more than the control group. But it also became clear that the psychedelically experienced individuals had a significantly higher tendency to express entoptic forms already before the ayahuasca ceremony, compared to the inexperienced control group. From a scientific perspective, the significance of the study is limited, as the authors acknowledge themselves. From an energetic-ecstatic point of view, however, the study can be understood as a more general insight into the perception and interpretation of entoptic phenomena on the basis of consciousness intensifying practices. The results of the study suggest that such practices have a long term effect on the visibility of entoptic phenomena, or on the individual perceptual sensitivity for such phenomena, respectively. This is evident by the fact that the tendency to draw entoptic forms already before the ayahuasca ceremony is four to five times higher in the psychedelically experienced compared to the control group. This also means that entoptic phenomena are not necessarily associated with creative abilities. For in contrast to the entoptic sensitivity, the creativity factors appear to be increased only for a short time. It follows a new insight: The special significance that was given to entoptic phenomena by shamans, seers and artists from different times and cultures, may be based not only on the fact that entoptics are seen in more intense states of consciousness, but also on the fact that they influence these individuals’ expression for longer periods, regardless of the form and quality of that expression. Overall, the study can be understood as an argument for the theory that many abstract and geometric shapes in art history go back to the perception of and work with entoptic phenomena – especially if the artworks are accompanied or influenced by rituals of consciousness intensification, or if such influence can be assumed from the cultural context. 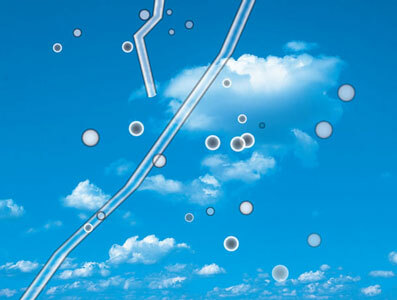 Finally, the study’s results may also be applied to the shining structure floaters. On the one hand, floaters also belong to the forms that are perceived in more intense states of consciousness. On the other hand, the theory of shining structure floaters as vitreous opacities can not be maintained on closer inspection, and floaters are, therefore, better understood in terms of entoptic phenomena (Tausin 2011a and 2011b). Thanks, Holly and John. I wish you and all readers a delightful and warm autumn – and much time to see and be amazed!